April 19, 2013 – 8:30 a.m. – 5:30 p.m.
CLE Registration $150.00 is available for Attorneys seeking CLE credits. Please Join Us! Please help us spread the word about this important conference . The College of Law has hired Robert J. Miller, one of the nation’s leading scholars in Indian Law, and Gregory L. Hill, who will serve as Executive Director of the Indian Legal Program. Miller will join the faculty in the fall of 2013. 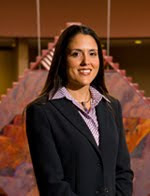 As a professor at Lewis & Clark Law School in Portland, Ore., since 1999, Miller has taught various courses, including Federal Indian Law, American Indians and International Law and Civil Procedure. He worked at the Stoel Rives law firm from 1992-1995 and practiced Indian law with Hobbs, Straus, Dean & Walker from 1995-1999. An enrolled citizen of the Eastern Shawnee Tribe of Oklahoma, Miller is Chief Justice of the Court of Appeals of the Grand Ronde Tribe and sits as a judge for other tribes. Hill, a practicing attorney for 18 years, has held various leadership positions in the legal profession since 1995. A member of the Oneida Nation, Six Nations of Indians, he most recently served as a capital attorney in the Office of the Public Defender in Tampa, Fla., where he provided legal services to indigent clients. He is a former deputy director of Stetson University College of Law’s National Clearinghouse for Science, Technology and the Law. Additionally, Hill served as Assistant Attorney General in the state of Florida, ran a solo legal practice earlier in his career, and clerked for the general counsel of the Seneca Nation while in law school. The Indian Legal Program was established in 1988 to provide legal education and generate scholarship in the area of Indian law and to undertake public service to tribal governments. It trains students to effectively engage the representation of Native peoples and seeks to promote an understanding of the differences between the legal systems of Indian nations and those of the state and federal governments. The Program is among the most renowned of its kind, and its graduates work at all levels of tribal, state and federal government, as well as in private practice. The Program provides a unique set of academic and clinical opportunities for students and is committed to maintaining strong partnerships with American Indian nations and other native governments and organizations. Please join us. 2 general CLE credits. $20 NABA-AZ members $25 non-members. Pay at the door. 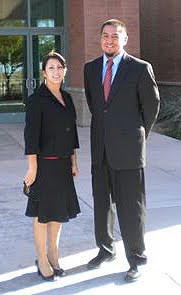 April Olson andDerrick Beetso Derrick Beetso, a third-year law student in the Indian Legal Clinic, recently assisted April Olson (Class of 2006) in an appeal before the Court of Appeals of the Gila River Indian Community. Olson successfully prosecuted the defendant on the charges of theft and robbery. The defendant raised three issues on appeal: (1) whether the trial court improperly precluded witnesses; (2) whether the trial court improperly admitted opinion testimony; and (3) whether the trial judge improperly relied on facts not in evidence. Through the Indian Legal Clinic’s partnership with the Gila River Indian Community Prosecutor’s Office, Beetso was asked to argue the merits of the case before a three-judge panel of the Gila River Court of Appeals. The case was argued on Sept. 16, and the Court of Appeals issued a decision affirming the trial court decision in favor of the Community On Dec. 28. On behalf of the ILP, I wanted to share exciting news and a link. Patty Ferguson Bohnee and four Indian Legal Clinic students are in Washington DC today. Patty was asked to present testimony at an oversight hearing on “Fixing the Federal Acknowledgment Process” for the Senate Committee on Indian Affairs. Patty was invited to speak last week and the students helped her prepare her testimony. If you would like to see the testimony you can watch now at the following link. http://indian.senate.gov/public/index.cfm?FuseAction=Hearings.LiveStream It is my understanding that Patty will be the last speaker today. On a side note, the students will also have an opportunity to watch a Supreme Court oral argument while in DC. What a great opportunity for our students!